A key figure in Northern Ireland’s peace process has been honoured by the University of Ulster. 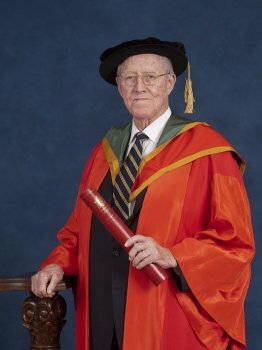 Leading Irish-American businessman William ‘Bill’ Flynn, former chairman of Mutual of America, received the honorary degree of Doctor of Laws (LLD) for his services to peace andreconciliation. A first-generation Irish-American with roots in Mayo and Down, he is considered by many to have played a pivotal role in the Northern Ireland peace process. He graduated from Fordham University in 1951, before going on to work for Equitable Life Assurance Society. Later he joined Mutual of America, then a struggling company. Three decades, under his guidance, it had become one of the top US insurance companies. In 2009 he was awarded an honorary CBE in recognition of his exceptional contribution to peace and reconciliation in Northern Ireland.